These two exercises will help your upper body counteract the rotational forces generated by your running stride — for more efficient, injury-free training. Running is a total-body exercise. Although your lower half is what propels you forward, a stronger upper body will help you become a more efficient, injury-proofed runner. Here are two solid exercises that’ll make a big difference, but won’t require you to sell ‘tickets to the gun show’ next time you’re in the gym (unless you want to). When you’re running, your upper body has to work in tandem with your lower body to resist the rotational forces generated by the movement of your legs. As you stride forward, your counteracting arm movements and your core stability help stop your torso from rotating from side to side. A weaker upper body will be less effective at countering these forces, which can increase fatigue, slow you down, and can even lead to injury. A stronger upper body will help you run with your shoulders pinned back, your breathing unrestricted, and your body free from inefficient compensatory movements. If running over mountains is your thing, then a stronger upper body will also help you deal with the burden of wearing a pack (even a well-packed race vest feels heavy if you run far enough). That added upper-body strength will make a noticeable difference as you drive up steep ascents, pushing off your quads or leaning on your poles. Many upper-body exercises can be broken down into pushing or pulling movements. Pushing movements mainly (but not exclusively) involve anterior muscles on the front of your upper body, which work in tandem with your abdominals and quadriceps. 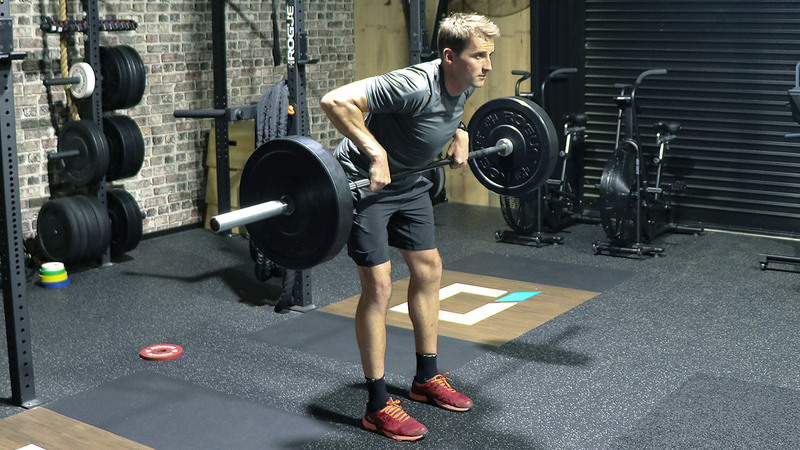 Pulling movements are mostly posterior dominant, and engage the muscles on your upper, mid, and lower back that work in conjunction with your glutes and hamstrings. Here are two exercises that will make your upper body stronger through both pulling and pushing: the overhead press and the bent-over row. Otherwise known as the strict press or military press, this is the ultimate pushing movement. This move strengthens your triceps and deltoids while also engaging your core as it stabilizes your torso. It also hits the upper back, so you’re achieving quite a lot with just one exercise. 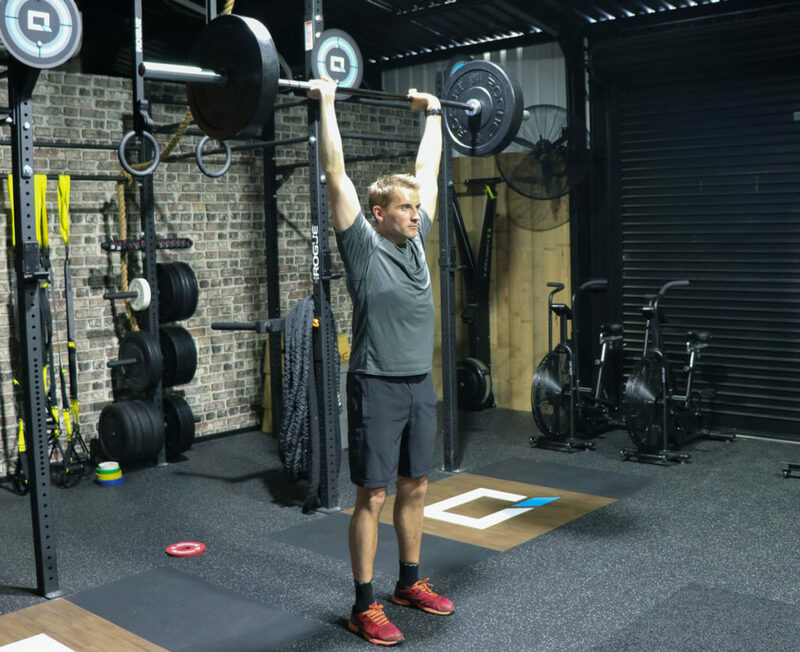 The overhead press is ideal if you’re strapped for time, but remember not to drive with your legs or let your pelvis drift forward. If you’re struggling to complete a rep at a certain weight, consider going lighter until you can complete the movement correctly. The bent-over row is another highly-effective exercise. This move promotes back strength that leads to increased spine and pelvic stability, which helps with better posture when you run. The ‘BO row’ also strengthens your biceps, leading to a more powerful arm drive. If you’re not sure about the importance of this movement, try going for a run with your arms clamped to your sides! Your back should stay fixed in the bent-over position throughout the row. Make sure not to ‘jerk’ your back to move the barbell if it’s heavy. Again, if you feel like you need to adjust the movement, drop the weight. You can fit both of these exercises into one workout quite comfortably, but they could also be completed individually if needed.. Remember, the goal of strength work for running isn’t muscular endurance — you’ll get enough of that through actual running. In the gym, your aim should be to encourage adaptations that allow you to exert and cope with increased force. You’ve got to lift heavy, and this means fewer reps and more weight! There are many rep schemes you can follow, but I’m personally a fan of ‘5 x 5’ for upper body exercises because it’s effective and straightforward. Simply do five sets of five reps of the exercise, with three minutes of recovery between sets. By the time you hit your fifth rep, you shouldn’t feel able to go for a sixth. 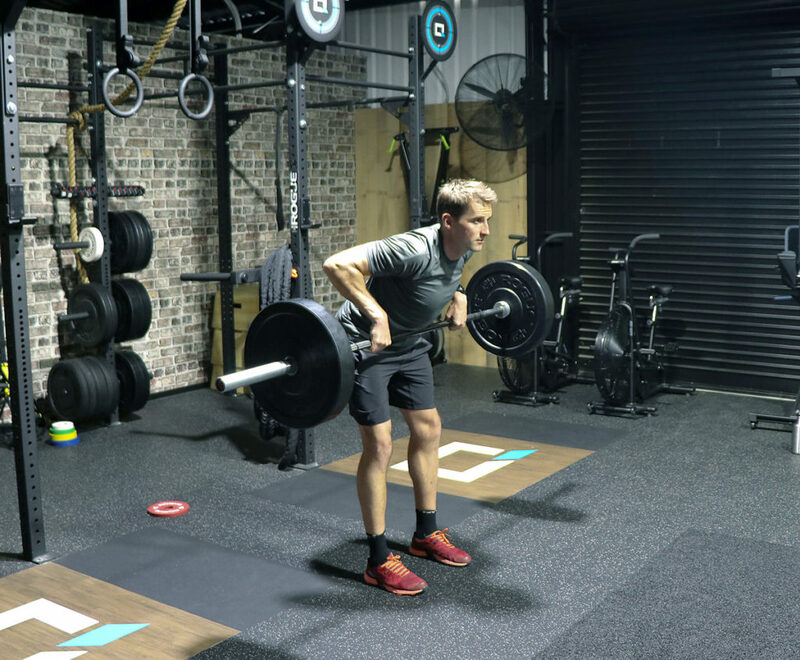 To start, carry out a full-body warm-up and mobility routine, followed by at least three lighter sets with progressively heavier weight before you jump into your 5 x 5 routine.